Supination or underpronation of the foot occurs when your weight rolls onto the outer edges of your feet. In a normal step, your foot should roll inward a bit (pronate) so that your weight is on the ball of your foot, causing you to push off from the big toe. When you supinate, the ankle rolls outward after landing, causing extra stress on the foot. Custom moldable orthotic insoles are designed to improve alignment and provide the mechanics you need to reduce pain and prevent further injury. If the mechanics of your foot are a little bit off, it can throw off the alignment of your entire body. Excessive supination of your feet can lead to ankle injuries, stress on the knee, hip and/or back pain and plantar fasciitis. Supination is commonly a result of genetics but can also be triggered or worsened by muscle imbalances in the foot, ankle and lower leg. Improper footwear, former injuries and repetitive stress lead to muscle disparity and misalignment in the body. 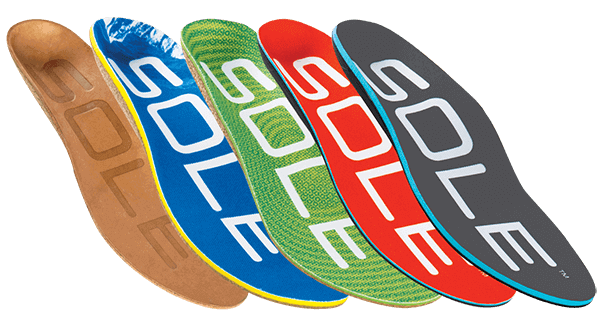 The orthopedic shape and customization of SOLE’s footbeds provide the neutralized alignment and industry-leading shock absorption you need to reduce pain, prevent injury and put your best foot forward. I first purchased these for my snowboarding boots as the outside of my ankle had too much pressure in my boots. After I put in the footbeds, that pain went away almost entirely. I have high arches and have suffered from heal spurs before. My prescription orthotics were starting wear and began hurting my feet. I was looking for a less expensive alternative and stumbled upon your website after reading an article on running. I am extremely pleased with your products and the difference it has made in my workouts. I will be a customer for life. Thanks!!! I have had problems with my high arches for many years now, with very tired feet after running and walking in general. Having had custom made orthotics over the years and not really addressing my problem I was somewhat skeptical trying the Active Medium, but I was very impressed after following the instructions. I am now feeling the overall benefit and they have improved my gait as noticed when I train. I will definitely purchase another pair shortly. They work fantastic. I am a distance runner who is training for Boston. I also am 5' 9" and 200 lbs. I have a lot of strain on my arches. Before I started using the SOLE footbeds I had problems with plantar fasciitis in my left arch. Since I put the footbeds in I have had no problems what so ever. I am averaging about 40-50 miles per week in them. I did a 22 mile training run yesterday without any problems. I love your product and would highly recommend them to anyone.